You know that your vacation has gone wrong when you need to find your way back home by working. But it can still be one of your favorite trips if it was as fun as the adventures of the characters in Katy and Bob: Way Back Home. You can buy some antiques that are supposed to help you get a ticket back home. It wasn't all for the fun only. You are to be part of the story when a rich dad teaches his children that success comes through hard work. Having found the wayto get them to a remote island, he now challenges them to earn the money for their tickets back home. 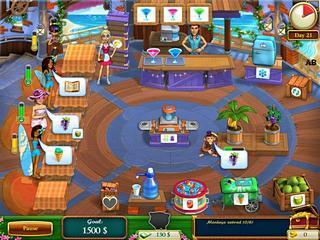 They earn them by working at a tropical bar serving customers and entertaining them in any possible way. Here's what you do over and over again. You take orders from customers with varying levels of patience, order cocktails from the bar (it will take some time), serve ice creams and drinks and you get to pick a fruit to make juice out of it. Growing a fruit and and making juice will take some time too. One last thing that you can do is to light the fireworks. But you can only do this if you have enough hearts from the happy cusomers. The heart just like your tips you get to pick up from the floor. Maybe it is about teaching the kids something? Not sure. 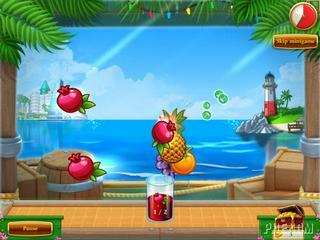 As in many time management game, you can buy improvements for the bar for the maney you make. You can also buy some antiques that are supposed to help you get a ticket back home. The game is not unique in any way, but it does have a nice story and challenging tasks. It's great to read someinthg that's both enjoyable and provides pragmatisdc solutions. This is Katy and Bob: Way Back Home review. Download this game here.